I took the opportunity this weekend to try out a couple of new tracks; on the Saturday, it was one just outside of Birmingham. Looking at the track online, it seemed to be a very technical and demanding circuit and when I arrived it didn’t disappoint. I arrived fairly early for my session, but this gave me the opportunity to stand on the balcony and view the drivers who were out on track before me. One thing that struck me from the beginning was how helpful the staff were there; I’ve always liked the people of the Midlands, and especially Birmingham (I spent four years studying at the university there). The track was very foreboding; the dark, under-track section was very difficult to see from the balcony and I didn’t know what to expect until I got track side. Due to the length of the circuit, more drivers were allowed on in each session – this also slightly worried me before I took to the track because there seemed to be a significant number of collisions in the previous races (although there were also a lot of black flags for dangerous driving). Whilst a part of me was apprehensive, another part of me was raring to go. 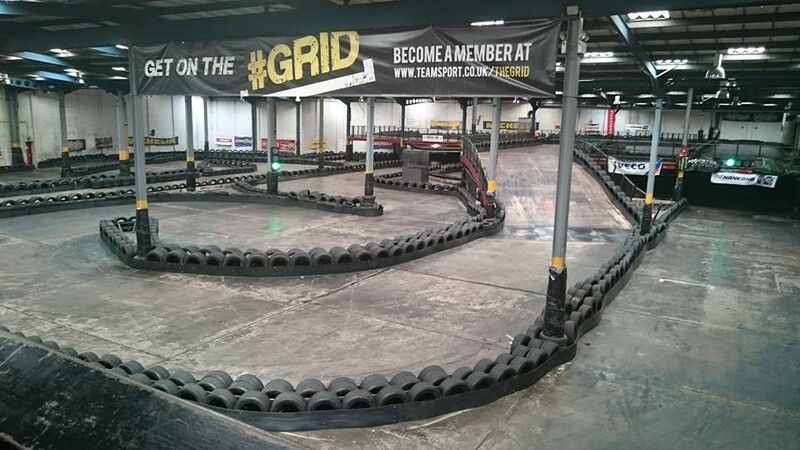 The track was run like clockwork; whilst the current drivers were finishing their race the next heat of drivers were in their karts in the pits, ready to go. I wasn’t expecting to set particularly fast lap times, especially not in the first few laps as I thought I would take the time to learn the circuit without being too reckless. However, if you give a racer clear air, then you do push it a little bit harder. In fact, my fastest lap time came in the fourth lap of during the first race, as later on in the session, the traffic started to back up and a few yellow flags came out. I was amazed, and very pleased, to set a 52.5s laptime and finish second on the leaderboard for the first race. During the interval one of the other drivers came up to apologize for hitting me in the first session; I really didn’t know where/when he had hit me and I couldn’t remember it affecting me at all, so I accepted his apology, explained that I’ve been in a lot worse on the track and for him not to worry because this is part and parcel of motorsport. In the second session, I was just looking to better my time – I wasn’t trying to race anybody or top the leaderboard, I just wanted to improve and be more consistent. I did expect to get faster and faster as the session went on, but this didn’t happen for any of the drivers (both myself and the person who topped the leaderboard set our fastest laps on the second lap of the session). I was very consistent (out of the 13 laps without a yellow flag, I lapped within 4 seconds of my best time and my last four laps were separated by approximately half a second). I didn’t manage to break the 50s barrier but I came away satisfied with a 50.759s lap. As I left the venue I was aching already; the track was long, twisty and tight in places and it put a real strain on my body as I drove back to the hotel, but I thought it was a brilliant track and I really enjoyed my time racing in Oldbury. If I had to make a minor criticism it would be down to the positioning and quantity of the warning lights for yellow and red flags; there are certain sections of the track where no lights are visible causing people to make mistakes and possibly overtake under yellows. A nice little touch, that I really appreciated, was that my times were emailed to me, as well as receiving a paper copy at the time. I will certainly be coming back to this track and am already looking at booking for the next time that I am up in the Midlands! So two second place finishes in a timed session at Birmingham, could I go one better tomorrow in a 50 lap race in Loughborough? Crash! Bang! Wallop! What a Video! once you lift off after the long straight, the engine kind of backfires which is something I love to hear.